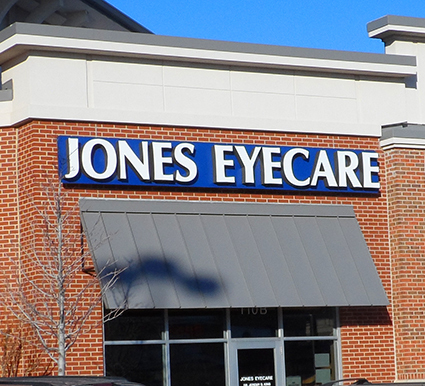 Jones Eyecare in MWC, Oklahoma is conveniently located just north of Tinker Air Force Base. Our Midwest City eyecare office opened in December of 1993 and we are currently located in the Town Center Plaza near Tinker Air Force Base. We are committed to providing the best eye care and personal service to our patients in a friendly atmosphere. This office is proud to serve a large number of the employees and military personnel of Tinker Air Force Base. We provide the following goods and services at our Midwest City office. Comprehensive eye examinations which include glaucoma and cataract screenings. Dilated eye examinations to check for eye disease including diabetic and hypertensive retinopathy. Contact Lens examinations and fitting. We fit all major brands of contacts and specialize in hard to fit contact lens cases. We offer contact lenses for astigmatism, bifocal contacts and rigid gas permeable contacts as well as colored contacts and soft disposable lenses. We now offer safe and convenient online reordering of contact lenses through our website. We are happy to fill outside contact lens prescriptions. If we don’t have your particular brand in stock, we can usually have them for you in one week. Please come and visit us at our Midwest City location! Please print and fill out our Patient Information Form (pdf) and bring it with you to your appointment. Please view our Health Information Privacy Policies and Procedures HIPPA Form (pdf). Dr. Jones Eyecare Staff in Midwest City was very friendly and helpfull. Dr. Jones was very nice and answered all my questions and concerns. I will definitely recommend this eyecare clinic to others. I have been going to Dr. Jones for several years. I am very pleased with the staff. Dr. Jones is always so efficient. I will continue to go to Dr. Jones. The care I received is excellent. Jones Eyecare. All Rights Reserved.